This will be a relaxed evening for attendees to enjoy and meet others.There will be Cawl Cennin / Leek soup and much singing. 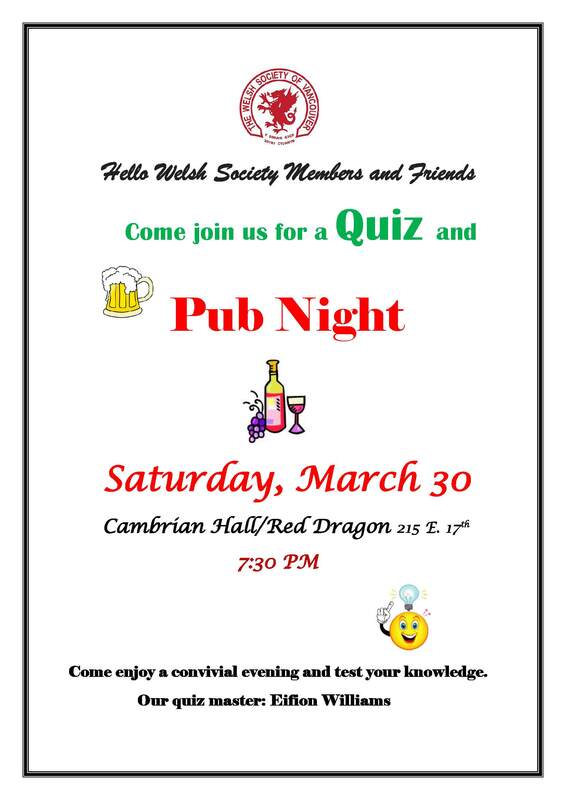 The celebration will be held at the Cambrian Hall and the doors will be open at 6 pm, the dinner will be served at 7 pm. This will be an evening of delightful food and entertainment. The musical entertainment will be presented by harpist Leanne Page (see leanneharpsong.com) and the dinner will be catered by Granville Island Caterers. 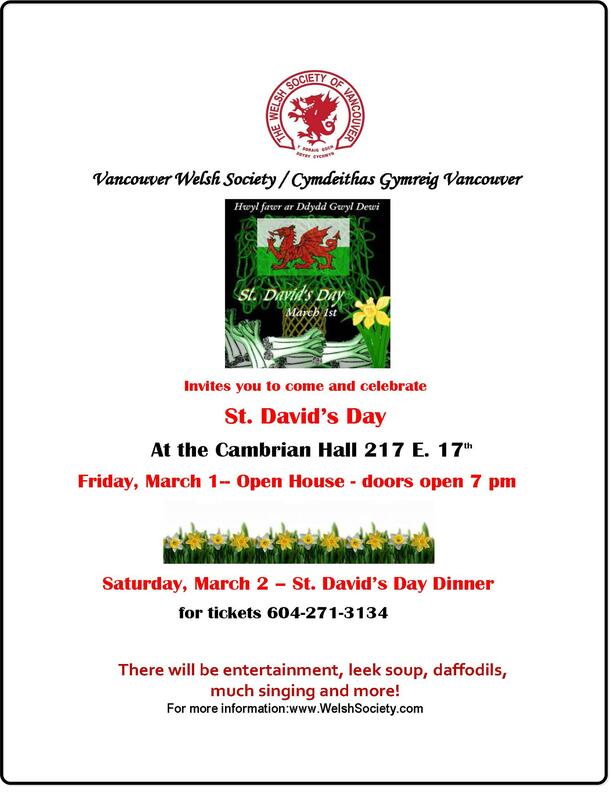 Tickets at $45 each from Gaynor Evans by phone (604 271-3134) or email fgevans@telus.net. Please reserve before Tuesday, February 26th. The book this month is “Reservoir Thirteen” by Jon McGregor. This time there will be a guest speaker, Eunice Robinson, President of the B. C. Genealogical Society. She will be focusing on “How to Start Your Family History Research” but will be available to answer any questions pertaining to genealogical research. 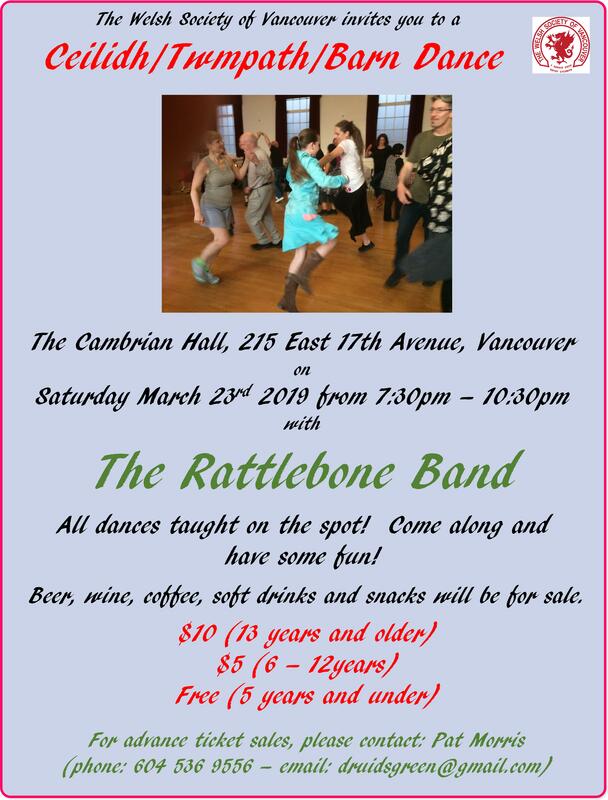 The next dance will be held at The Cambrian Hall and will again feature The Rattlebone Band. All dances taught on the spot! Come along and have some fun! Beer, wine, coffee, soft drinks and snacks will be available for sale. This will be held on Saturday, April 27th 10 am till 2 pm. Further details on our April page, click here.